The Fukagawa Hachiman Matsuri is considered top three summer festival in Tokyo. The festival is held on August 15th and thirty thousand people participate and half a million people are watching. Every year, more than 50 teams walk the roads of Fukagawa while carrying 2,000-kilogram-mikoshi, or portable shrines. 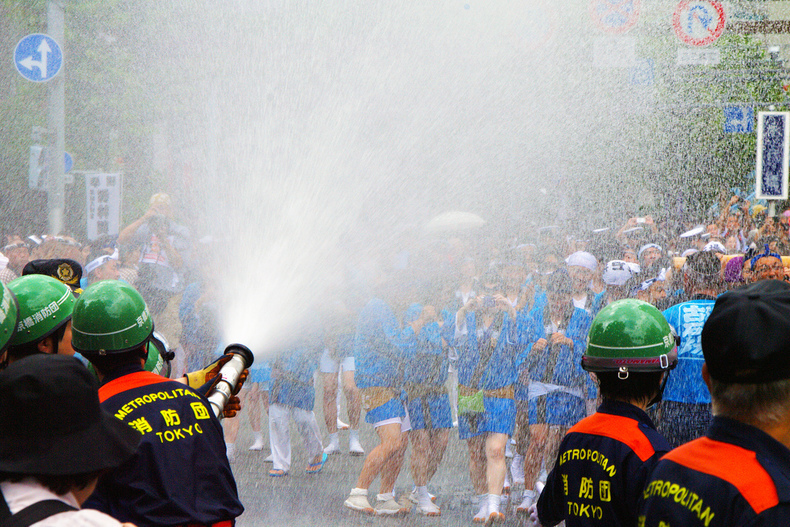 The bystanders throw water to the participants so that people can clean the shrines, and cool down the participants under the hot sun in Tokyo. Even the fire department throw water from fire hoses. At the end, so as to show the vitality, the participants throw the mikoshi in the air. In the picture below, we can see that even firefighters participate in this festival. Once in three years, people carry a mikoshi with a Phoenix on the top which belongs to the Tomioka Hachiman Shrine. At the beginning of the festival, male participants sing a song called, “Kiyari,” which was a call or a shout to carry a large timber. Then comes the “tekomais,” who lead the float. They used to be Fukagawa geisha, and they had a male’s hair and clothing. As you can see in the photo below, tekomais have gold stick on their right hand and a lantern with their name on their left hand. During Edo period, the east side of Sumida river such as Honjo and Fukagawa got populated. There were a lot of temples and shrines since more people started to live in Shitamachi. People usually pray for coming of a deity at that time. Another reason that it got populated is that there was a fire in Edo-city and people moved to places where was a suburb. In fact, Tomioka Hachiman Shrine was established in 1627, 27 years after Tokugawa shogunate opened Edo. As more people come, people wanted to have entertainments. Shrines such as Tomioka Hachiman Shrine and other started to hold festivals. Fukagawa geisha were also popular, so they started to participate in those festivals in the mid-Edo. This is why Fukagawa geisha started to appear in the festival.